Home > Dot Coms / Internet > Network Associates, Inc. 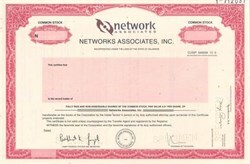 Beautifully engraved specimen certificate from the Network Associates, Inc. . This historic document has an ornate border around it with a vignette of the company's logo. This item has the printed signatures of the Company’s Chairman and CFO/Secretary. Founded as McAfee Associates in 1989. Network Associates, Inc. was created by the merger of McAfee Associates and Network General in December of 1997. With headquarters in Santa Clara, Calif., Network Associates, Inc. is a leading supplier of security and availability solutions for e-businesses. Network Associates is comprised of three product groups: McAfee, delivering world class anti-virus products; Sniffer Technologies, a leader in network and application management; and Magic Solutions, providing web-based service desk solutions. On December 1, 1999, Network Associates offered 17 percent of McAfee.com in an initial public offering. That company is now publicly traded on the NASDAQ Stock Market under the symbol MCAF. Network Associates retains ownership of approximately 80 percent of the company. Network Associates products and services are available to customers worldwide through a range of distribution channels, tailored to how our customers wish to do business. Approximately 70 percent of the company's domestic business, and in excess of 90 percent of the company's international business, is conducted through channel partners, including distributors and value-added resellers. In December of 2000, the company announced a transition in its practices related to distribution revenue recognition, from a sell-in model to a sell-through model.